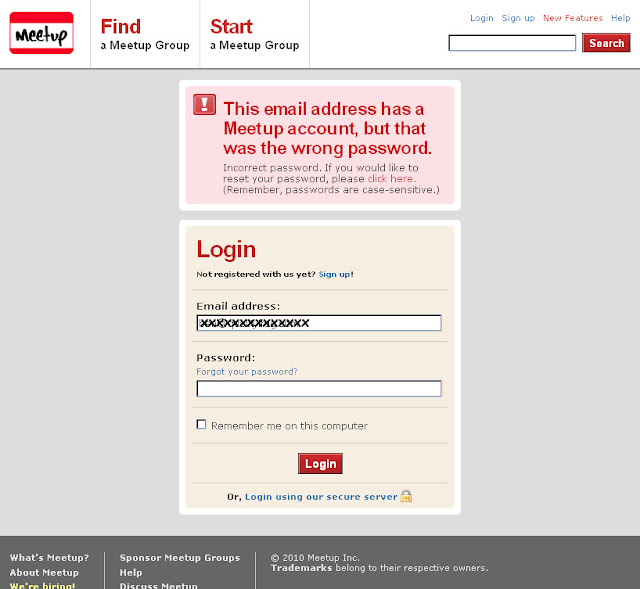 I got the above screen after failing to login to my Meetup account to RSVP for a meeting. As a user, I like that it tells me that I used the correct email address but wrong password. However, this system has just verified information without authentication. It tells me that a valid user email address was used. This information could be helpful to someone trying to gain unauthorized access. Now, in this case, I don't think disclosing that email accounts exist is a huge deal. This is a social networking site. This is not a banking system. This is not a medical records system. It is not an interface to access private information. Meetup profiles are public and searchable on the web -- although not email addresses. I say no problem in the context of this site. For other systems, giving non-authenticated people information that narrows down access credential options could be a huge security problem.